Jill is a self-employed mother of one 16 year old son named Austin and is engaged to her wonderful fiancee, Brad. She owns Lyons Publishing and publishes the phone book for Acadia Parish. Jill grew up surrounded by crafty women. Her mother and grandmother were seamstresses and did other needlework. When she was about 10 years old, a cousin taught her to crochet granny squares, and she has been crocheting on and off since then. Jill enjoys crocheting afghans and baby blankets most of all. Recently, Jill read the books Friday Night Knitting Club and Knit Two and was inspired to learn to knit. Searching the Internet for a yarn shop in Lafayette, she found Yarn Nook and visited the shop. Jill and Kim hit it off right away and she has been taking lessons for the past two months. She has learned to knit continental style because of her background in crochet. Jill is working on three different knitting projects right now and is pictured here with a beautiful ruffle edged scarf that she will soon cast-off. Spending time at Yarn Nook several times a week has become something that Jill looks forward to. Her favorite thing about the shop is how much fun everyone has and the great friends she has made. She enjoys the interaction among people of all ages and skill levels, and the feeling of community at Yarn Nook. Jill loves spending time with her new friends and spent last weekend participating in the Race for the Cure as a member of the Yarn Nooker Team. Jill says, "The diversity in personalities and creativity of the women at Yarn Nook is amazing. I could have gotten a book on knitting and tried to teach myself, but Kim made it so easy for me and I love being a part of the Yarn Nook family!" 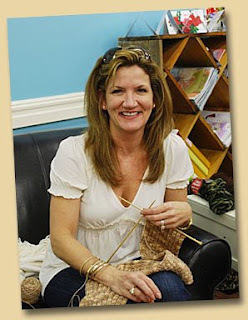 Jill's goal with her knitting is to make beautiful items that she will love to wear! After seeing her scarf, we all know that she is on the right track. Great job Jill!